Thus far, I have observed three significant issues with both the current Beta and release versions of Affinity Photo. 1. The Macro has very limited capabilities. Kind of useless except for the most mundane actions. 2. When an image is opened, it appears as a docked image and the frame around it is not collapsed around the image. This is a big pain and time consuming if you want to display multiple images. Affinity Photo appears to be a product advertised as a replacement for PS. While it has many great features, it lacks several basic functions that I suspect go way beyond my little list. Affinity Photo appears to be a product advertised as a replacement for PS. Not by Serif, that I have seen. I agree with the macros being limited thus far. while technically true, It appears that its sometimes quoted and linked to outside reviews on Twitter, Facebook and other official Affinity accounts. Thanks. Yes, I would agree that that is an advertisement, even though they're quoting someone else. 1. The Macro has very limited capabilities. Kind of useless except for the most mundane actions. We hope to add more comprehensive macro capabilities in the future. For now, if there is anything specific you would really like to see, it's worth mentioning it in the Feature Request section of the forum. 2. When an image is opened, it appears as a docked image and the frame around it is not collapsed around the image. This is a big pain and time consuming if you want to display multiple images. If you only open a single image, you cannot undock it unless you are in Separated Mode. 3. A variety of settings that should remain set by the user revert to the factory settings. For example. Pixels vs. Inches, Refine settings, and many more. More lost time. 1.7 has started to address some of these settings and we have started making some of them 'sticky'. Possibly not relevant to you, but we have made some settings in the Crop Tool sticky. As time goes on, I'm sure we will add to this. Affinity Photo appears to be a product advertised as a replacement for PS. While it has many great features, it lacks several basic functions that I suspect go way beyond my little list. We have never claimed to be a replacement for PS. If you only open a single image, you cannot undock it unless you are in Separated Mode. Based on other posts, Dennis is using Windows, so that does not apply. Even with a single image opened, on Windows Window > Float or dragging the image tab away from the docked area will float it. This is not an advertisement by Serif but the heading used by techradar to show Affinity as an alternative for Photoshop. Affinity Photo has been described as an Adobe Photoshop alternative, compatible with common file formats including Adobe's PSD. Looks basically alike,does the same thing, but isn't. A wikipedia page may be written by anyone. In all fairness to Serif, third party reviews and Wikipedia entries can hardly be described as their advertising. 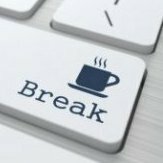 At the risk of being rude to anyone, if you expect a new piece of software like AP to have all the bells and whistles (plus all the baggage!) of a long established one like Photoshop, at a fraction of the price, then you're living on another planet!!! With respect to Wikipedia, I agree. However, when Serif's Affinity Facebook account posts links to reviews that talk about Affinity being an Adobe replacement, it starts to become their advertising. They had a choice of posting the link, or not posting it, if it's saying something they disagree with. Or, they could post the link but comment to clarify that Serif doesn't think of Affinity as being an Adobe replacement. Or, they could post the link but comment to clarify that Serif doesn't think of Affinity as being an Adobe replacement﻿. For the reason I explained. If Serif posts a link to a review that is Serif advertising their product. If that review calls them an Adobe replacement then if they do not say something different they are implicitly agreeing. If they don't agree they should say so, or not post that link. 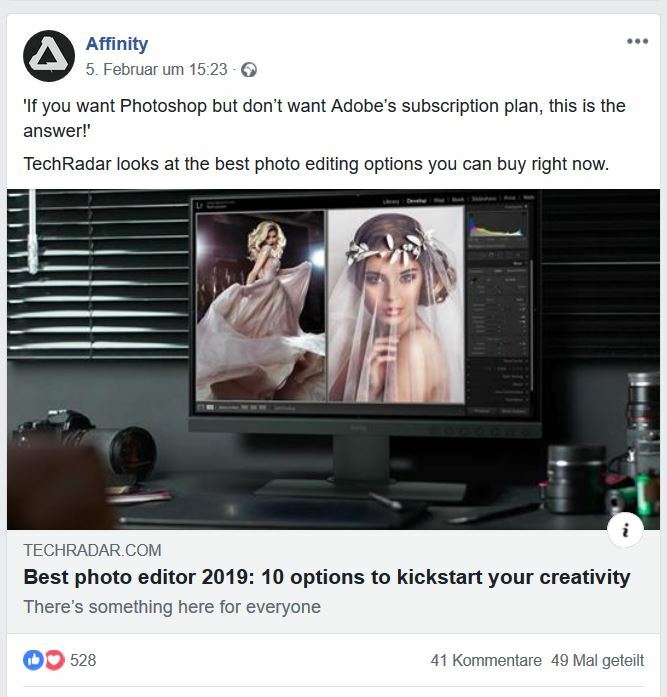 For example, the Facebook post shown above, where the linked article starts out with a headline saying that if you want Photoshop without Adobe subscription plan, consider Affinity. That statement is the very first thing the reader sees under the Affinity logo indicating who said it. But that's the opinion of someone at techradar. I think if someone has an opinion about a product and sees it as a true competitor you may be proud. Why should one devaluate oneself and be modest if that means people would think less of you. Not claiming to be the same. Of course it is. But if you repeat that opinion, without a disclaimer, you have now "owned" that opinion for the purpose of advertising. If you don't want to own that opinion, don't use it in your advertising. My opinion in this is the same as the development direction at Serif,let them make their own choices. Maybe the old mantra applies, "any news is good news"
This is not a valid argument as the chosen price point was entirely up to Serif. I would pay as much for the Affinity Suite as I paid for the small Adobe Design Standard Suite (even without getting Acrobat), if it offered equal value. My sole reason for looking into alternatives for Adobe apps - which I enjoy using - is that I find renting content creation software unacceptable. On the previously discussed issue, whether Affinity Photo is actively marketed as a replacement for Photoshop, just one more observation: I have to admit that I did not book Youtube ads yet – but I did so in a variety of other social channels. Here one can usually narrow down very closely the desired audience and also bid for relevant search keywords. When you link to a review you should always use the headline of the review. If Serif had deliberately change the linking text to something deep in the review which Serif wanted to use instead then that would have been misleading, unethical and manipulative. There is nothing wrong in Serif linking to reviews where the reviewer may (or may not) consider it as a replacement for some Photoshop users.